If you’re unfamiliar with League of Legends (often abbreviated LoL), the first thing we have to talk about is its globe-spanning popularity. Riot Games, LoL‘s developer, recently announced that it’s averaging a mind-blowing 103 million monthly players (i.e. individuals who play at least once a month). Prior to this announcement, Riot had last disclosed its player numbers in January 2014, when it claimed 67 million monthly players and 27 million daily players, so the game is continuing to grow in popularity even 7 years after its initial release. Perhaps even more interestingly, while Riot did not break out its average number of daily players in the latest announcement, if we assume that the proportions of monthly to daily players from 2014 still hold, then somewhere on the order of 40 million people around the world play LoL on any given day (roughly equivalent to the population of Algeria). Compare those numbers to something like Pokémon Go, which you surely heard about during the big craze in July. At its peak, Pokémon Go was averaging around 43 million daily users worldwide (see Figure 1 here), but has since seen a precipitous drop-off in its player base. And while it’s not a perfect comparison, the bottom line is that insofar as you thought that Pokémon Go was significant/important/worthy of further study, you should be even more interested in the bigger, richer, and much more stable LoL. Indeed, one (admittedly non-randomly-sampled, and hence suspect) analysis done in November 2015 found that LoL accounted for 23% of all the time people spend playing online computer games. Ok, so the game is a big deal, at least for people who play computer games. But the second thing you need to know about LoL is that people don’t simply play the game, they also watch it. As in, they watch highly-skilled professional players compete live or online as a form of entertainment. Watching video games in this way is called e-sports, and e-sports, according to its proselytizers, is the future of all sports. I don’t want to wade too much into that debate (you can instead read a random Wall Street Journal columnist tackle it here). Rather, what’s significant for our purposes is that the biggest LoL competition of the year is the annual World Championship, which 334 million viewers across the world tuned into last year (a number which will be undoubtedly even higher for this year). And the World Championship is directly owned and operated by Riot Games, which invites the teams, chooses the venues (this year’s finals will be in a sold-out Staples Center in downtown Los Angeles), broadcasts the matches, and sets the overall tone of the event. The third thing about LoL we have to talk about is “the Koreans.” Statistically speaking, professional LoL teams based in South Korea are the most dominant in the world. As the figure below shows, while South Korean teams have only made up 19% of the entrants in the five most recent LoL Worlds, they have taken 33% of the quarter-finals spots, 50% of the semi-finals spots, and 70% of the finals spots. A Taiwanese team managed to take home the trophy in the 2012 tournament, but since then a Korean team has won the top spot every year… including in this year’s finals, which hasn’t even happened yet, but given that both of the finalists are from South Korea, the trend is sure to continue. What makes the South Koreans so dominant (and not just at LoL, but e-sports more generally)? Arguably a series of interconnected factors: a well-established professional gaming infrastructure, with things like dedicated gaming houses, coaches, and support staff; financial and social rewards for elite pro players that are higher than anywhere else in the world; accordingly, more elite competitors in close proximity, giving Korean teams better opponents to practice with; and lastly, truly relentless training regimens. From the perspective of Riot Games, the continued streak of Korean dominance at Worlds is not necessarily a bad thing, since it generates some handy narratives and provides a useful framing device everyone can grasp: will this finally be the year the Koreans are upset? Indeed, in my academic working paper I focus on how Riot Games is seeking to commodify nationalism in order to generate interest in its professional-level e-sports offerings while at the same time trying to avoid the problematic racism and xenophobia that is often prevalent in the online gaming community. This is an ongoing tight-rope walking act for the savvy, Chinese-owned but Santa Monica-based studio. Some other game developers have punted in similar situations. For instance, Blizzard Entertainment designed its popular Hearthstone game in such a way that players can only interact with one another through a very limited set of pre-scripted dialogue options, lessening the possibility of negative player interactions. At the other end of the spectrum, Valve Corporation seems to have little interest in policing the notoriously toxic Counter-Strike community. Overall, e-sports is already and quite unfortunately developing a reputation as a nasty realm, with all-too-frequent examples of racist language occurring (e.g. here, here, and here). And the misogynistic streaks rife in online gaming culture were on prominent display during the 2014 Gamergate saga. But at all times Riot remains extremely leery of opening the door to racist and chauvinist behavior from fans and players, which the company clearly believes would delegitimize its product, affect its bottom line,** and dash its dreams of bringing e-sports into the global mainstream. That fine line between healthy nationalism and troubling racism was on prominent display at this year’s LoL Worlds tournament. For instance, the Chicago crowd at the quarter-finals waved American flags and cheered on North American team Cloud 9 with chants of “U.S.A.! U.S.A.!”, but also had the dubious distinction of openly booing South Korea’s Samsung Galaxy team when they took the stage, a first for the LoL community (see reactions here and here). On an even less positive note, Riot took the drastic decision to formally sanction a professional Chinese player while the tournament was ongoing for having recently used racial slurs in non-tournament play. In the end, what all of this offers the outside observer is a window into the thinking of a hyper-globalized company that makes a digital product that it seeks to distribute and monetize across cultural lines. How can nationalism and international competition be commodified in “good” ways in the 21st century? We’ll have to see what Riot’s long-term answer is, and if it continues to prove as successful as it has. For the time being, though, if you’re at all curious about any of this, I invite you to tune into the world finals on Sunday. Put your money down on the Koreans. 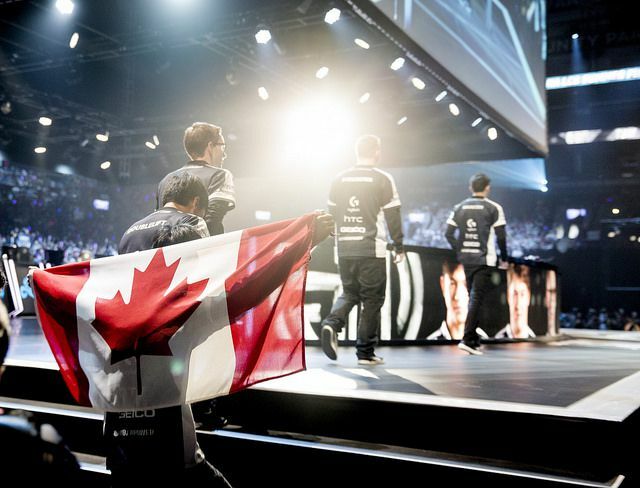 * Technically Team Solo Mid’s support player Biofrost wore the Canadian flag onstage at last month’s North American regional qualifier, not Worlds. ** For a useful discussion of the limitations of Riot’s commitment to diversity, particularly in its hiring of broadcast personnel, see Ferguson Mitchell’s commentary here. But see also Phil Kollar’s recent paean to Riot’s farsightedness and all-around decency here. The truth is doubtless somewhere in the middle. As Trump might put it, “SAD.” Read more here.